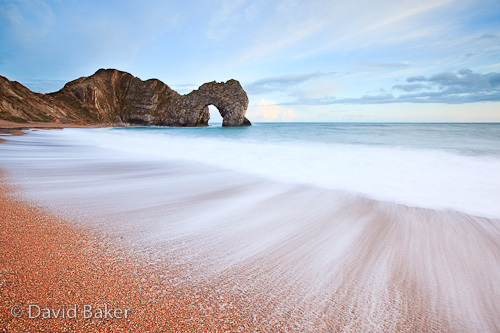 Another shot from the same evening as the previous two posts, this time the classic shot of Durdle Door. 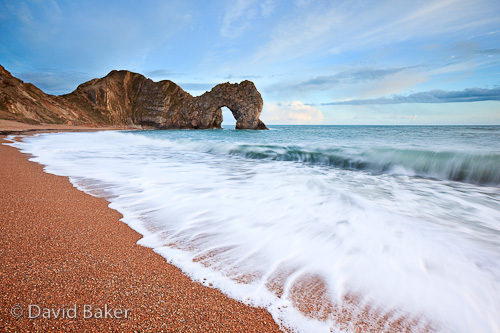 When shooting this iconic scene you have a couple of choices, do you use a shutter speed to catch a curling wave and use it as a lead in line or do you use a slightly longer shutter speed to catch the sea rushing back. I’ve included the shot below to demonstrate what I mean. Personally, I used to prefer the longer shutter speed but more recently I am leaning more towards the curling wave. ~ by David Baker on 3 April, 2010. Absolute Belter, What else can be said !